BESIX Group SA and Proximus have designed and built a new-generation smart building presenting cutting-edge innovations, for energy and environmental performance in particular. Since Monday 18 February 2019, this building houses the headquarters of BESIX Nederland. BESIX Group SA (BESIX) and Proximus have designed and built a next-generation smart building that can be considered as a European reference in the field. Located in Dordrecht, the Netherlands, it features cutting-edge innovations, aimed among other things at energy management and efficiency, sustainability, comfort and safety. 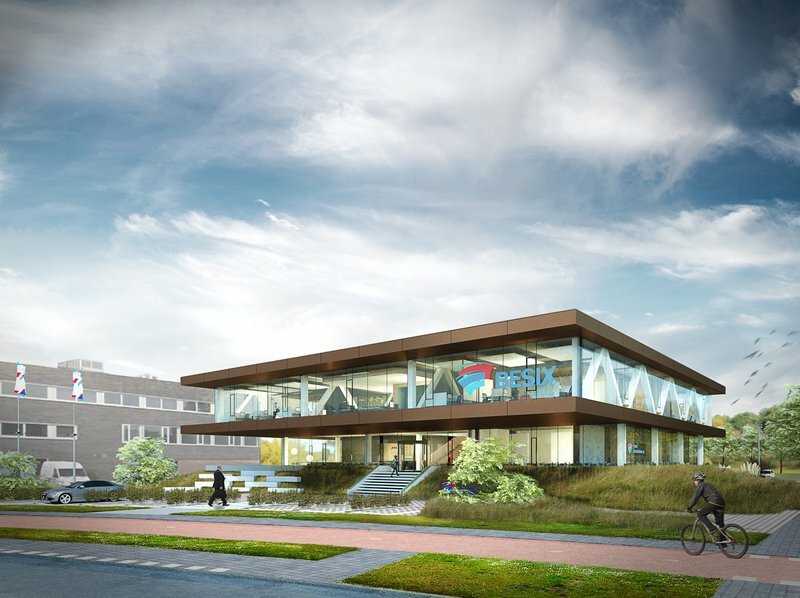 Housing the new BESIX Nederland headquarters, the building results from the strategic partnership that BESIX and Proximus entered into in 2018. Since then, the two companies have been developing smart buildings that they build themselves, from design and construction to the integration of new technologies. Both companies are leaders in Belgium in their respective sectors of activity. BESIX is a global player in the construction of complex projects. Proximus is a reference in the Information and Communication Technologies (ICT) and Telecommunications sectors. The building offers a beautiful sample map of various technologies such as optical fibre and internal and external sensors. Users have applications to work more efficiently, better manage meeting rooms, facilitate access control and security. Moreover, the building produces its own electricity consumption and is equipped with a state-of-the-art energy management system that maximizes local energy consumption. Artificial intelligence algorithms monitor the balance between production, consumption and storage. In this way they help to stabilize the electricity network, which is of great importance in the transition to renewable energy sources. This is made possible by solar panels, an internal battery for energy surplus as well as the electric cars in the parking lot. The end result is a building of which the energy consumption, associated with first-class insulation, is optimized to the extreme. The internal architecture has been designed to combine these aspects of efficiency with user comfort. This includes the acoustics and an abundance of natural light. At the heart of the building is an open, transparent atrium, with greenery to provide a natural purification of the air. Rik Vandenberghe, CEO of BESIX: "Smart Buildings are the future of the construction sector. Dordrecht perfectly showcases this, for example through the use of Artificial Intelligence algorithms to optimize its electricity consumption. Our partnership with Proximus enables us to effectively implement these new technologies, with the aim to develop new housing and workplace concepts. It also perfectly illustrates BESIX’s purpose: to excel in creating sustainable solutions for a better world." Dominique Leroy, CEO of Proximus: "The Dordrecht case is an important step in the evolution of smart buildings. The new technology solutions, for example, reduces the CO2 emissions of this building. We are closely monitoring how these will be used, along with the feedback of the people now working in the building. All this will allow us to continue to develop further innovative solutions. The advantage of our partnership is to be able to apply them ourselves to concrete projects." Proximus Group is a telecommunication & ICT company operating in the Belgian and international markets, providing services to residential, enterprise and public customers. Through its Proximus and Scarlet brands, Proximus is the leading provider of telephony, internet, television and network-based ICT services in Belgium. Proximus is active in Luxembourg through its affiliates Telindus Luxembourg for ICT and Tango for telecom. In the Netherlands the company also offers ICT services through Telindus Netherlands. BICS is an affiliate responsible for international carrier services. BESIX Group SA is a global player and the leading group in Belgium in the field of construction. Active since 1909, the group is based in Brussels and operates in Europe, the Middle East, Oceania, Africa, North America and Asia. Its achievements include the Burj Khalifa in Dubai, the world's tallest tower, buildings of the European Parliament in Brussels, and the Grand Egyptian Museum on the Giza pyramids plateau. In the environmental field, BESIX took part in in the construction of the Carpe Diem Tower in the Paris district of La Défense, the first high-rise building in the world to obtain both LEED Platinum and HQE certification. It also participates it the construction of the world's first energy-neutral tunnel in the Netherlands. In Western Europe, the group and its subsidiaries construct many technologically advanced buildings, including passive ones. In the Middle East, BESIX builds, manages and maintains leading infrastructures for waste recycling and water treatment.